Excited for spring? Get inspiration from these five style bloggers and their spring styles! The season of bloom is a few weeks away, and some of us just can’t wait for it! Looking through Pinterest boards, Instagram accounts, and style blogs, I noticed that most of the fashion bloggers are preparing for Spring. Inevitably, the blooms are out on the runway in the form of dresses and accessories. That said, here are five of our favorite looks for you to draw inspiration from as early as now. 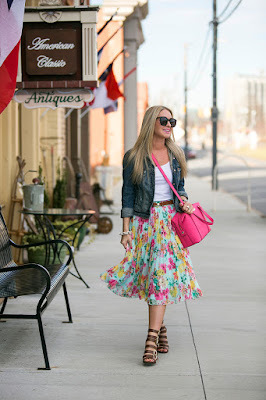 Cortney Dryden is a style blogger and marketing director from Charlotte, North Carolina. In these photos, she wore a gorgeous pleated floral skirt which I absolutely love, a denim jacket over a white tank top, and a pair of strappy heeled sandals. And to top off her look, she wore a chunky chain bracelet on her right wrists, layered bracelets on her left wrist, a minimalist geometric ring and a statement bow ring. Her lovely fuchsia pink bag matches her wardrobe and is very eye-catching. Believe it or not, classic stripes are also perfect for spring. 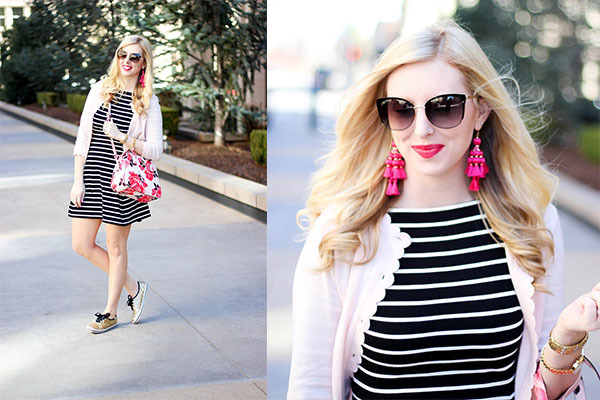 Kelssey Layton, a style blogger based in Oklahoma City, has nailed this spring look. She wore a soft pink cardigan over a casual stripe dress and a pair of gold glitter sneakers which definitely make a statement! 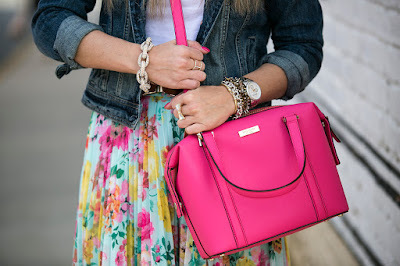 Kelssey accessorized with a bold pair of fuchsia chandelier earrings and a gold bangle and watch. To add an element of spring, she brought a gorgeous roses bag that perfectly matches her earrings. This floral romper is perfect for the ladies who love bold patterns in a dress but want to move around better. Lyndsey, a style blogger from Canada, wore this long-sleeved romper with a dusty pink suede biker jacket. She added a bit more edge to her feminine look with a pair of black cutout booties and a black leather bag. Since the romper is the statement piece in this style, she didn’t wear too much jewelry, just a minimalist ring on her left finger. If you want floral dresses that aren’t too loud, you can never go wrong with a white slip dress with floral embroidery. Jaime Kidd from Australia rocked this lovely dress! She wore a pair of white sandals and a beach straw hat. Jamie accessorized with gorgeous beaded pendant necklaces and bracelets. She adorned her index finger with a minimalist silver ring that matches the crescent moon pendants. Pastels and mint are perfect for spring. 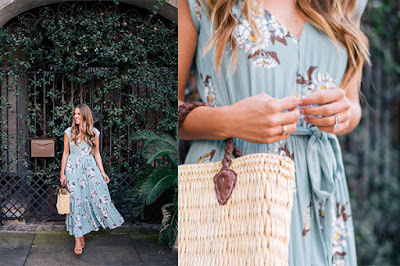 This floral maxi dress worn by Charleston style blogger, Julia Hengel is lovely! You can wear it on either a casual or dressy occasion, it’s just a matter of how you accessorize. For this look, Julia wore it with strappy heels and a tote for a dressy style. She also accessorized minimally; she wore a minimalist ring on her right hand to match the bridal rings on her left. Florals are definitely the way to go if you want to embrace the season of bloom. Pick the most feminine pieces from your jewelry display and jewelry organizers on your dresser and style your wardrobe like a pro! 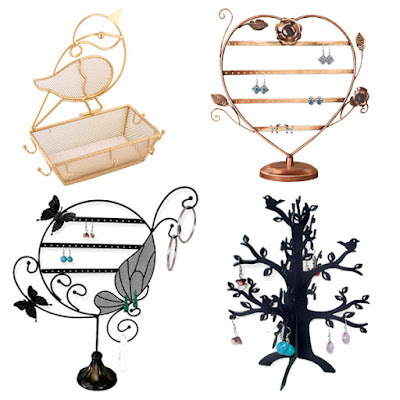 Go for a jewelry display with an old world charm that will look lovely all-year-round. Vintage is a style loved by many, especially the hopeless romantics and the old souls. I myself is a lover of this style, as it reminds me of the old world charm that makes me feel all warm and fuzzy inside. 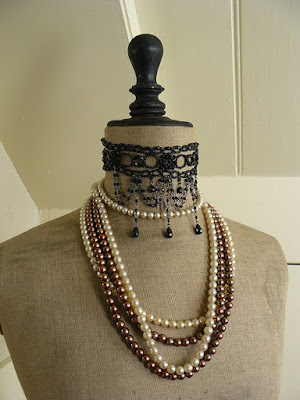 Vintage designs are so appealing, and they are perfect themes to use in a jewelry display. Attract more customers with these DIY vintage jewelry display ideas that will make them come back and purchase more of your products. These frames don’t need to be antique, as long as the design is vintage-inspired, it will do. My favorite are those frames with intricate filigree designs. The small square ones are perfect for small pieces like earrings and brooches and are great for highlighting such pieces. The large, round and mirror-like ones are perfect for necklaces and bracelets. You can also pin lace or mesh behind the frame so you can hang pairs of earrings as well. Antique dress forms remind of the glory days of Parisian high fashion in the 50s. It will make you think about vintage haute couture that focused on sophistication and femininity. Long full skirts and dresses were made to emphasize a small waist and full busts. 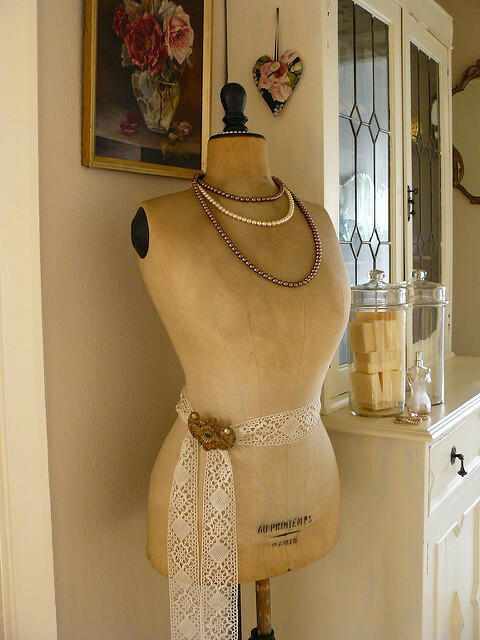 That said, they are great displays for vintage pieces such as heirloom pearl necklaces and vintage brooches. 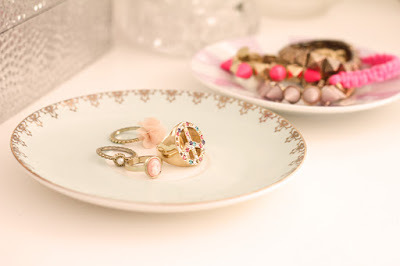 Antique China is one of the most beautiful displays you can ever use to showcase your jewelry. It works not only with heirloom pieces, but also with modern designs. Use the dinner plates for necklaces and bracelets, and use the salad plates for brooches, rings, and earrings. 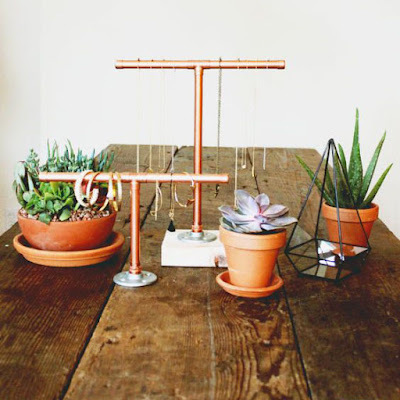 If you’re feeling extra creative, you can make a two-tier jewelry stand by gluing a vintage brass candlestick in between the two plates. This will appeal to your wanderlust customers. 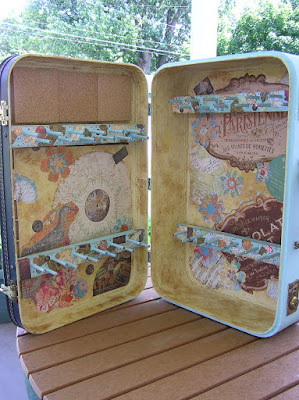 Decorate the old luggage with a Parisian theme, or rockabilly-themed photos. You can attach crossbars and pegs inside where you can hang the bracelets and necklaces. Add mesh or lace for the pairs of earrings. Push pins or pegs may hold the rings. Alternatively, you can just keep the luggage closed, and simply place the necklaces and other jewelry pieces on top of it. 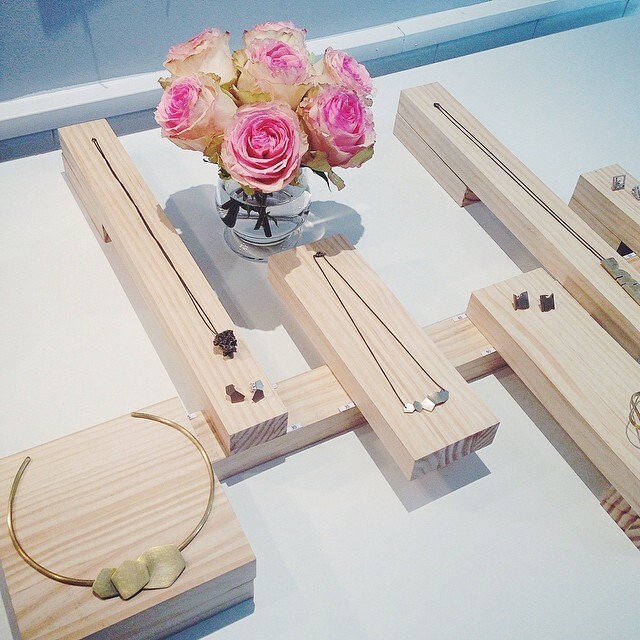 Jewelry organizers aren’t just for your dresser, they can also be used to showcase pieces in craft shows and jewelry shops. These organizers are usually made from metal, and they come in many designs and colors, including a vintage-inspired style. Choose organizers with soft colors, such as powder blue, baby pink, or white. Organizers in metallic colors such as bronze and gold look great too. 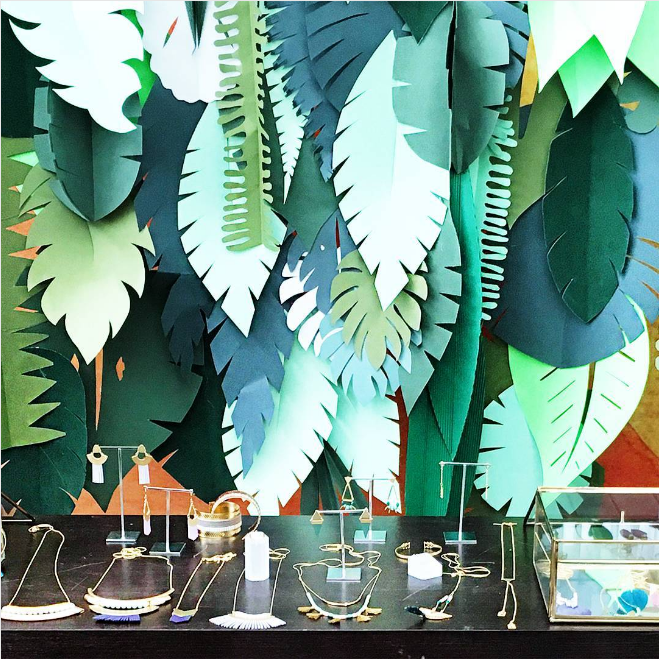 What’s your favorite among the five jewelry displays? Let us know in the comments below! Just a week to go before Valentine’s Day; have you picked out something for your special someone? If you do not prefer giving love letters, flowers and chocolates as gifts, you may opt to give her something else unique that will sweep her off of her feet. If the woman in your life is into jewelry and makeup, then you’re in luck! This week, we’ll be highlighting top three items that are perfect as Valentine gifts. For the woman who has a vast jewelry collection, a jewelry organizer is a perfect gift. She’ll be delighted to keep her pieces all organized and neatly displayed. 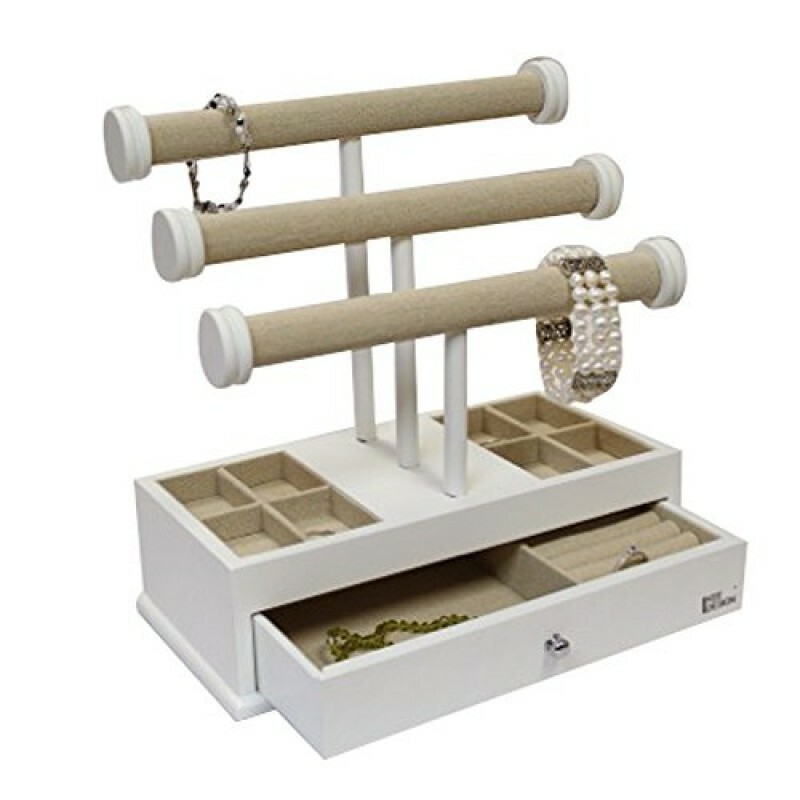 The Wooden Linen Triple Tier T-Bar Jewelry Organizer Case is just one of the many options; it’s not just an organizer case, but also a jewelry display. It features two trays on either side of the T-bar where she can place her pairs of earrings and fashion rings. The T-bars serve as displays for bangles, bracelets, and necklaces. The drawer features two compartments -- one with inserts for more of her rings and the other for almost any other jewelry piece. This is where you can place a jewelry piece, just imagine the surprise on her face! The Wooden Linen Triple Tier T-Bar Jewelry Organizer Case is perfect to place on a dresser or even the bedside table. Surprise her with this Photo Frame that doubles as a Wall Mounted Jewelry Organizer. 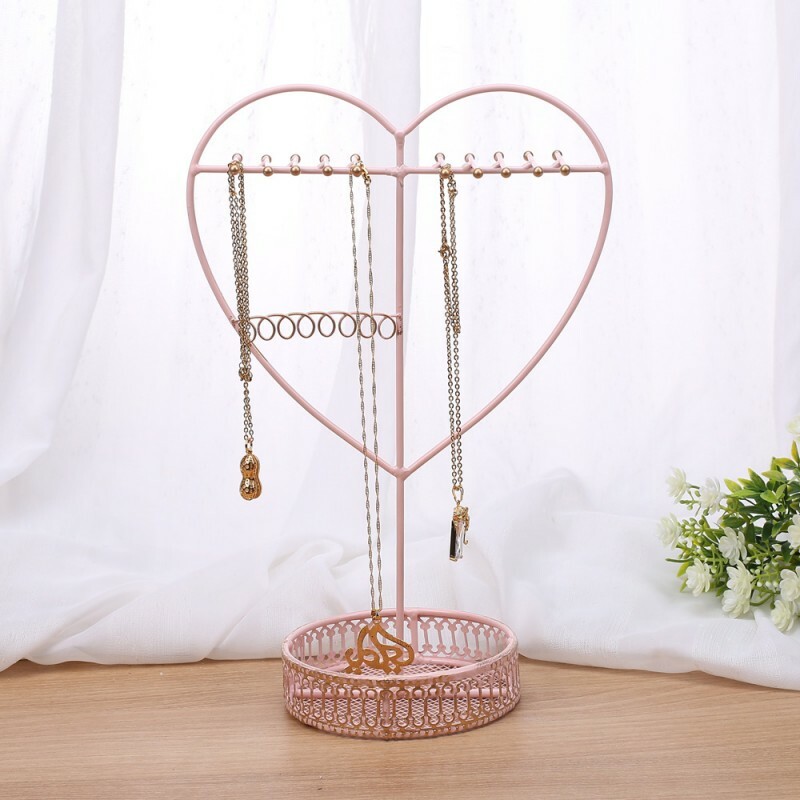 Place a collection of your sweetest photos together and tell her that it’s a special photo frame without telling her that it doubles as a jewelry organizer. Allow her to discover it on her own. 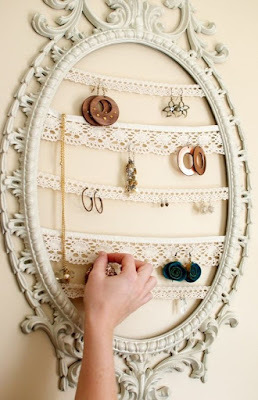 Place a necklace or a bracelet in the organizer so she’d know that there is something inside it. She’ll totally love the surprise and creativity! The Wall Mounted Jewelry Organizer with Photo Frame features metal hooks for necklaces or bracelets, ring slots, and earring holes. Cream tubes and small perfume bottles fit in there too. 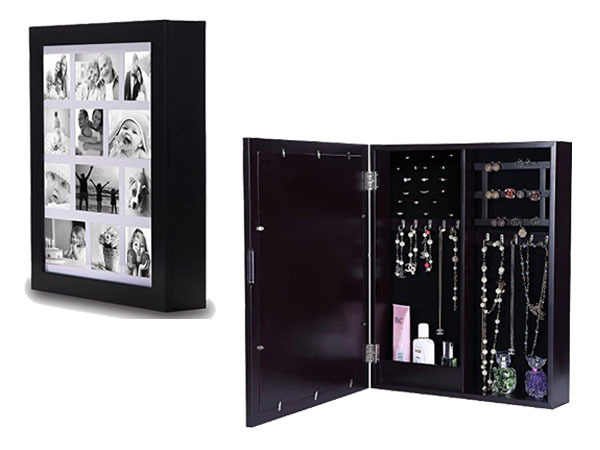 It will allow her to safely keep her jewelry pieces and beauty products as it doubles as a frame of your most memorable photos together. 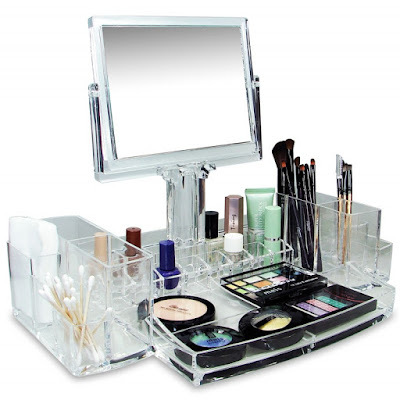 The perfect Valentine present for the lady who cannot leave the house without makeup is the Luxury Cosmetic Make Up Organizer With Two-Sided Mirror. This is the woman who probably has a collection of eyeshadow and lipsticks in many different palettes, as well as brushes and creams. Having a lot of makeup and beauty products need organizing. Otherwise, she might misplace a lipstick or brush, or worse, break them. The Luxury Cosmetic Make Up Organizer With Two-Sided Mirror will make things easier for her. It features premium acrylic compartments and a bottom drawer that won’t break easily. The two-sided mirror is an excellent addition to this organizer. She will thank you forever for this! Need more ideas for Valentine presents? Check out the shop for more!